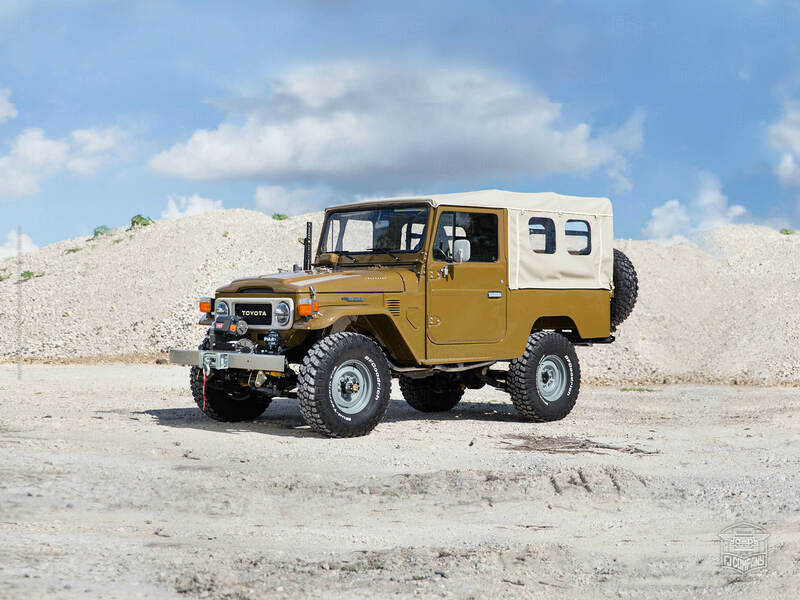 This matching-numbers 1981 FJ43 was transformed for a serious classic car enthusiast in search of an authentic Land Cruiser that could be enjoyed off-roading in Arizona, but would also serve as a great weekend driver for years to come. With this in mind, we maintained as much of the original vehicle as possible, while upgrading a few of its features to comply with those core objectives. As part of the full, frame-off restoration, we rebuilt the original 2F engine, the power steering, and the front disc brakes. We installed a new carburetor, new starter engine, new pumps, and we upgraded to a new aluminum radiator. For safety, we added a custom roll-cage, a fire extinguishing system, and we installed Corbeau MOAB seats with 4-point seat belts (optional), wrapped in custom "full grain" leather upholstery extended to the rear fold down seats and door panels. For comfort and drivability, the rig sports a new Old Man Emu suspension, 5-speed manual transmission, and LED headlights. Beyond that, we did some other minor upgrades to personalize the vehicle, while keeping it authentic and original Toyota Land Cruiser. The gorgeous paint job in Olive 637, a factory Toyota color, was chosen specifically to contrast with the beautiful mountains in Arizona and neighboring States.